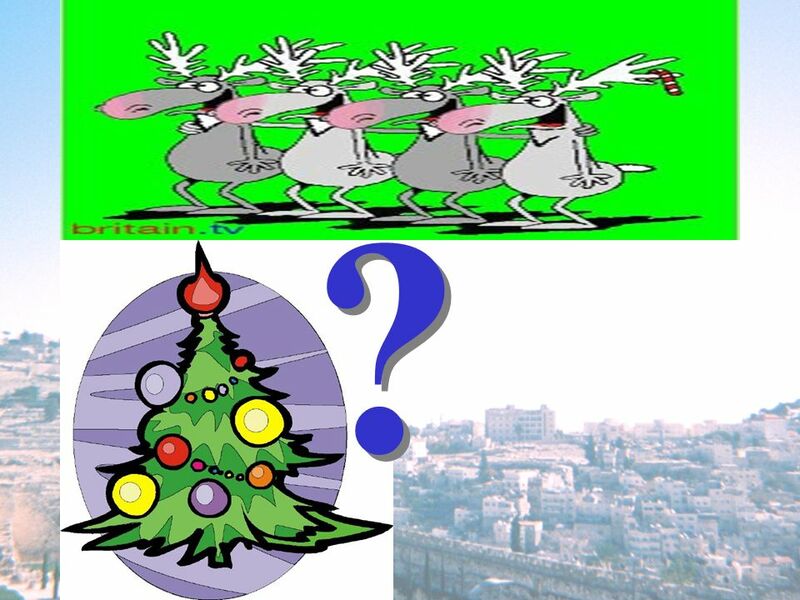 1 What is the Reason for the Season? 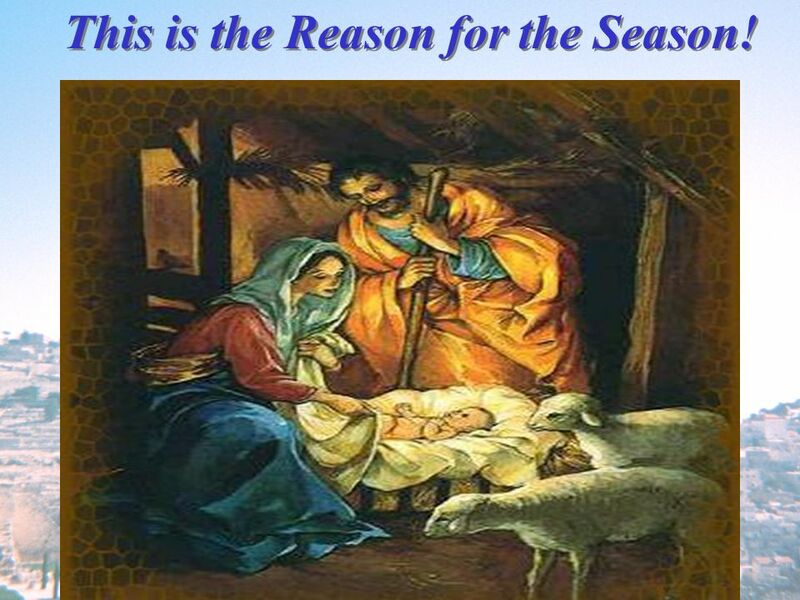 5 This is the Reason for the Season! 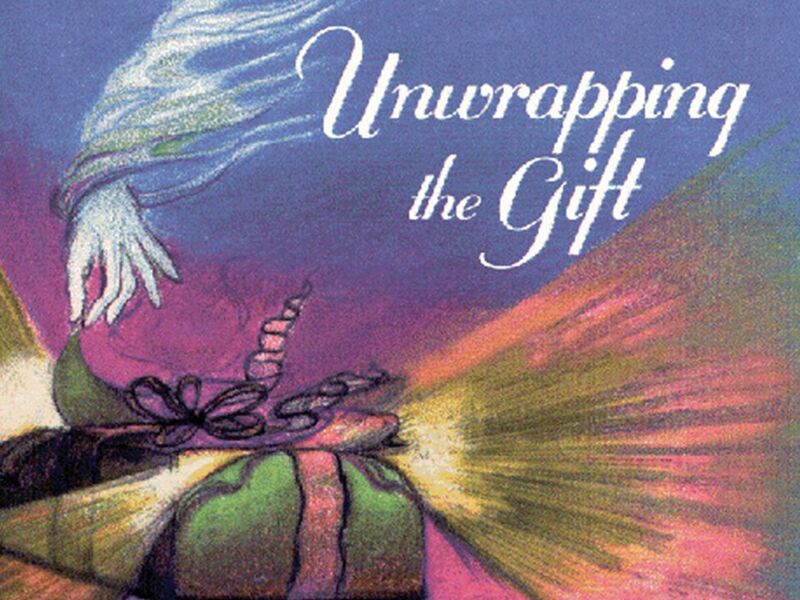 6 The Lamb of God A baby was born in Bethlehem, His body upon the sod. Where else should a lamb be born? 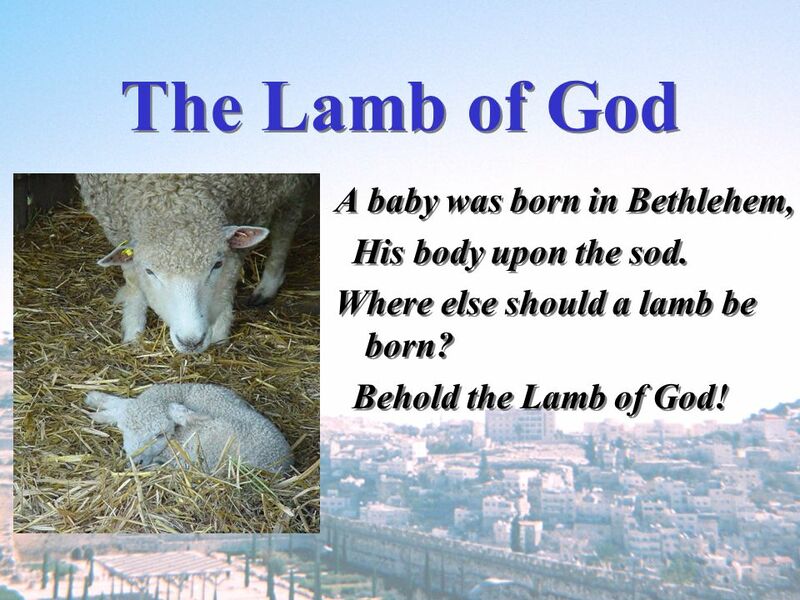 Behold the Lamb of God! “And the angels who did not keep their proper domain, but left their own habitation, He has reserved for everlasting chains…” (Jude 6). 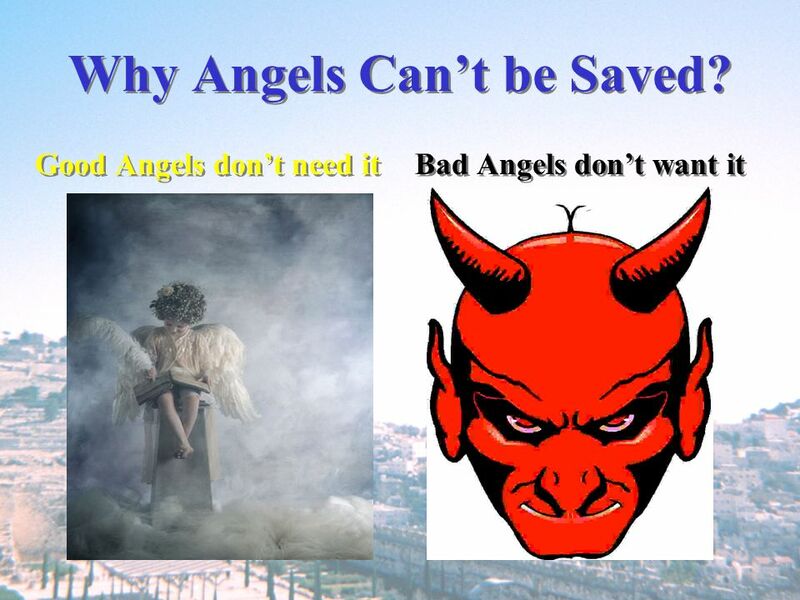 “For God did not spare the angels who sinned, but cast them down to hell…” (2Pet. 2:4). “Having disarmed principalities and powers, He made a public spectacle of them, triumphing over them in it” (Col. 2:15). “Depart from me you cursed, into the everlasting fire prepared for the devil and his angels” (Mt. 25:41). 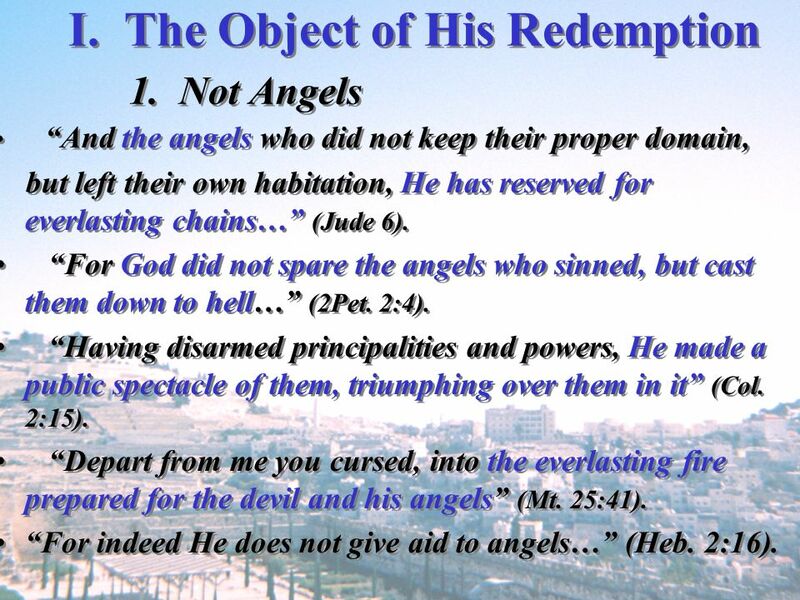 “For indeed He does not give aid to angels…” (Heb. 2:16). 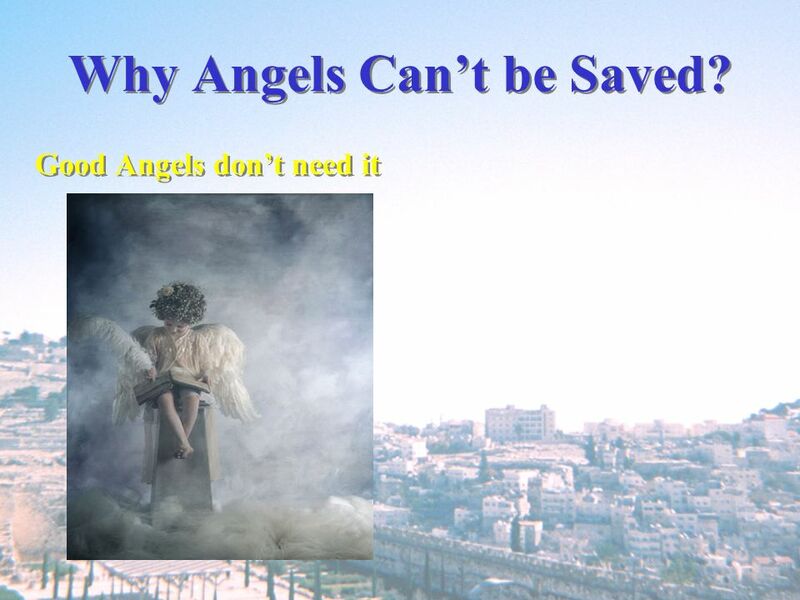 15 Why Angels Can’t be Saved? 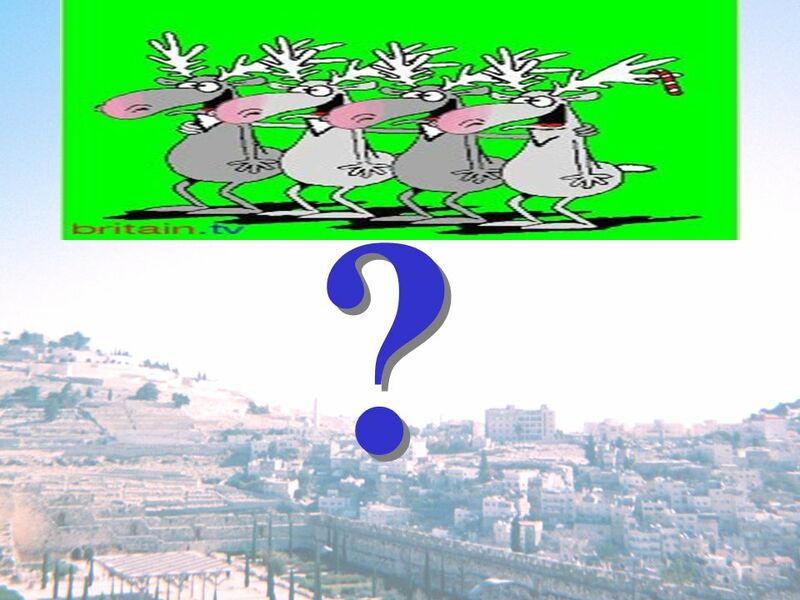 Because: 1) They are not a race (Mt. 22:30), and Christ could not die for all of them by assuming the nature of one of them, as He did for us (Rom. 5:12-21). 2) Angels can’t die (Lk. 22:36). 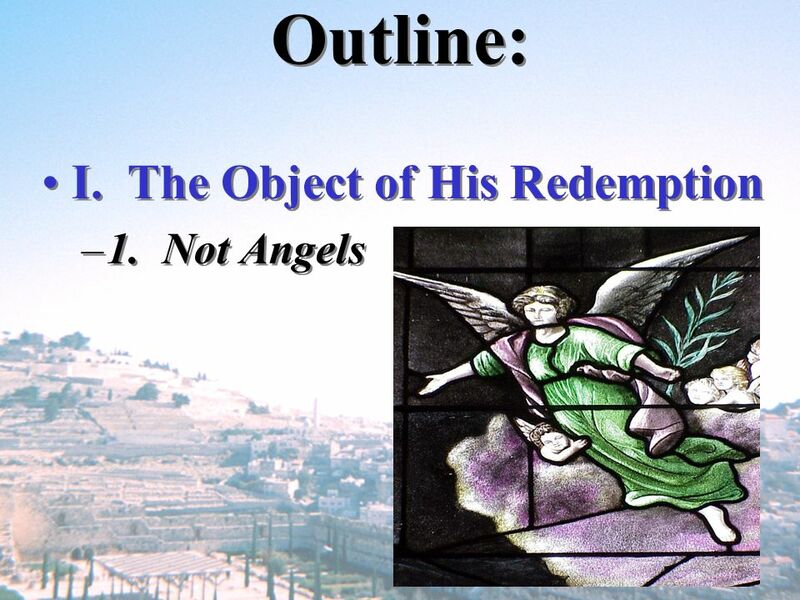 So, Christ could not die for their sins by assuming the nature of an angel. 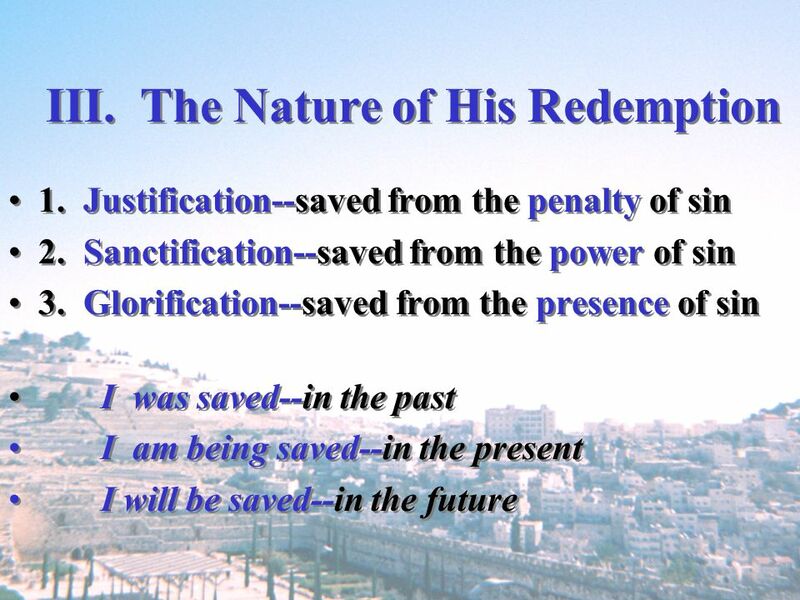 3) Salvation is a change (2Cor. 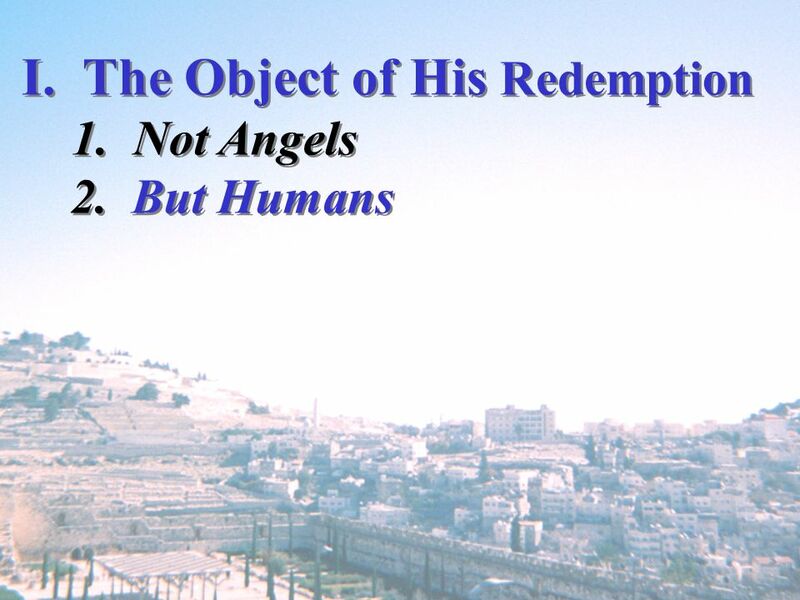 5:17), and angels don’t change in their nature (Heb. 1:14). 4) Their mind is made up from first moment of	their choice, as our is by the last moment (Hb. 9:27). 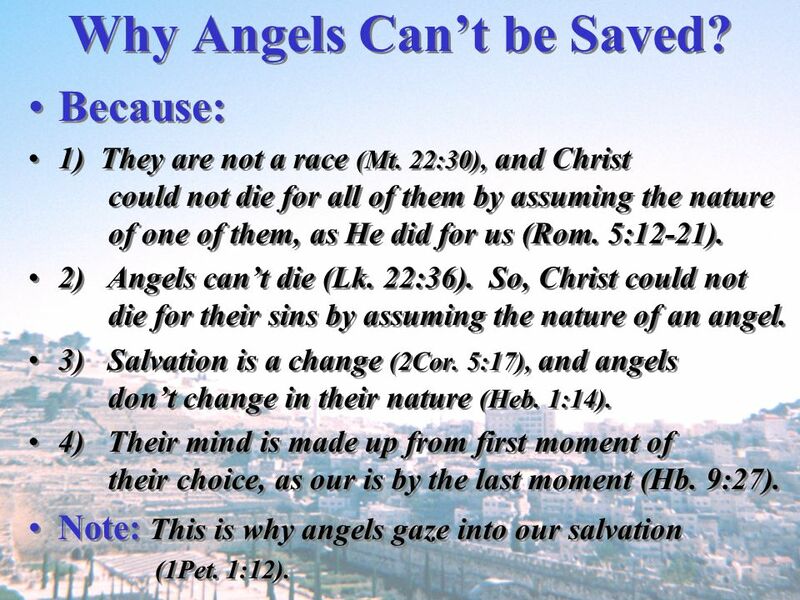 Note: This is why angels gaze into our salvation (1Pet. 1:12). 16 Why Angels Can’t be Saved? 17 Why Angels Can’t be Saved? I. 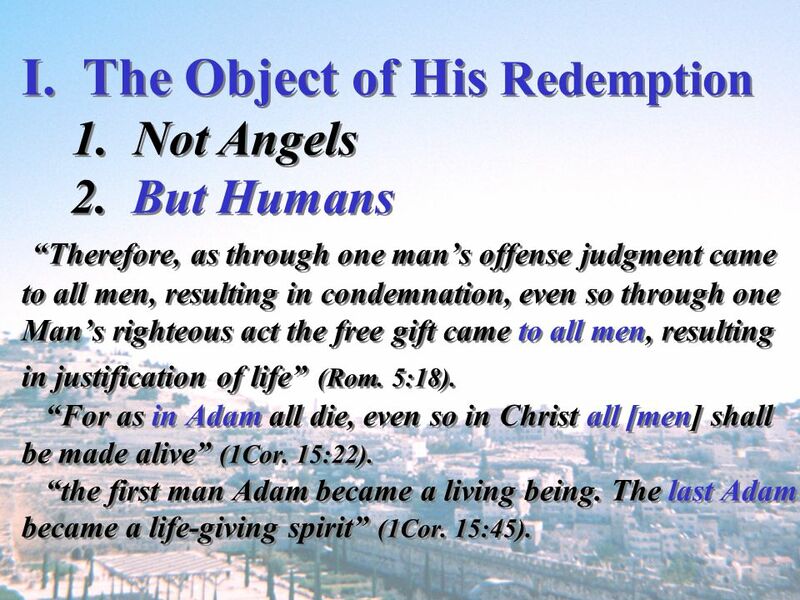 The Object of His Redemption Not Angels But Humans “Therefore, as through one man’s offense judgment came to all men, resulting in condemnation, even so through one Man’s righteous act the free gift came to all men, resulting in justification of life” (Rom. 5:18). “For as in Adam all die, even so in Christ all [men] shall be made alive” (1Cor. 15:22). 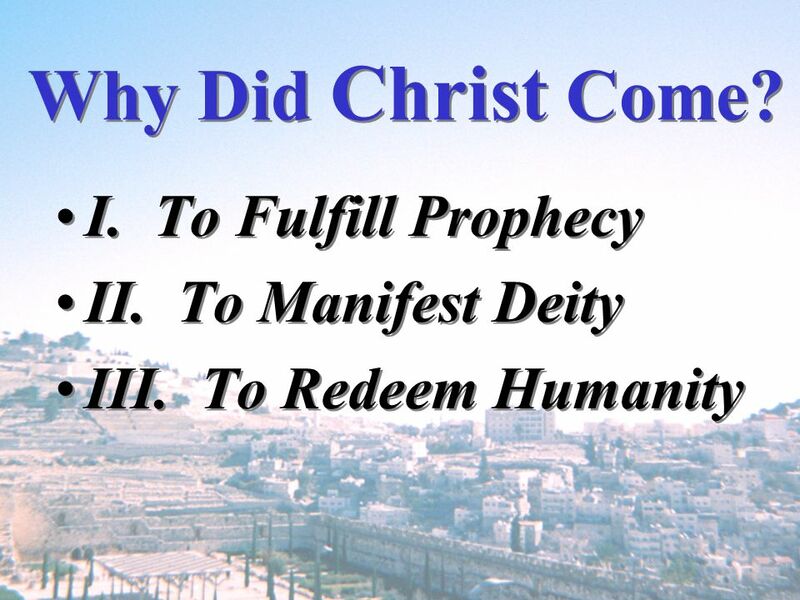 “the first man Adam became a living being. 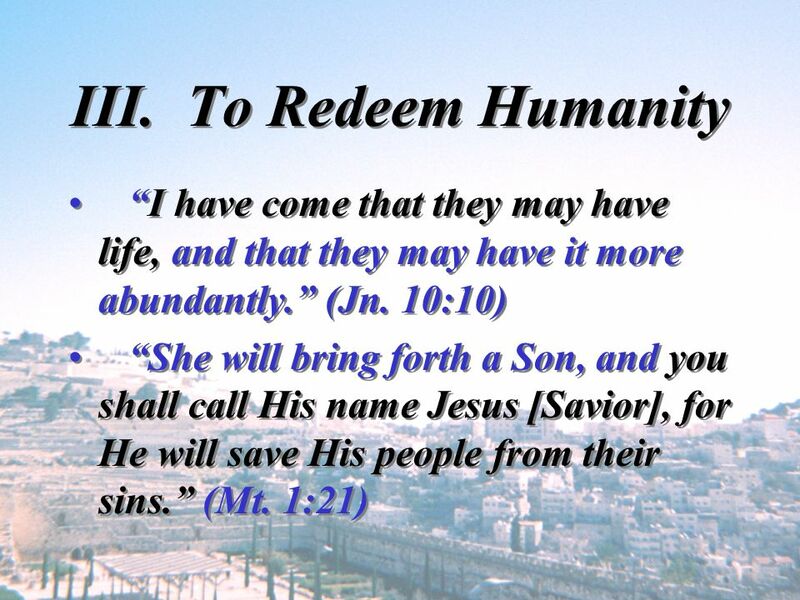 The last Adam became a life-giving spirit” (1Cor. 15:45). 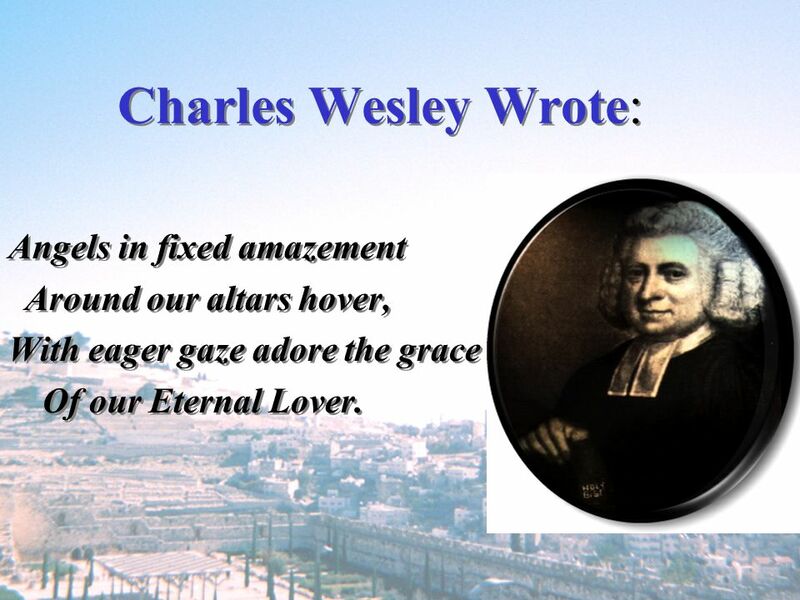 Around our altars hover, With eager gaze adore the grace Of our Eternal Lover. Holy, Holy, is what the angels sing, And I expect to help them make The courts of heaven ring. 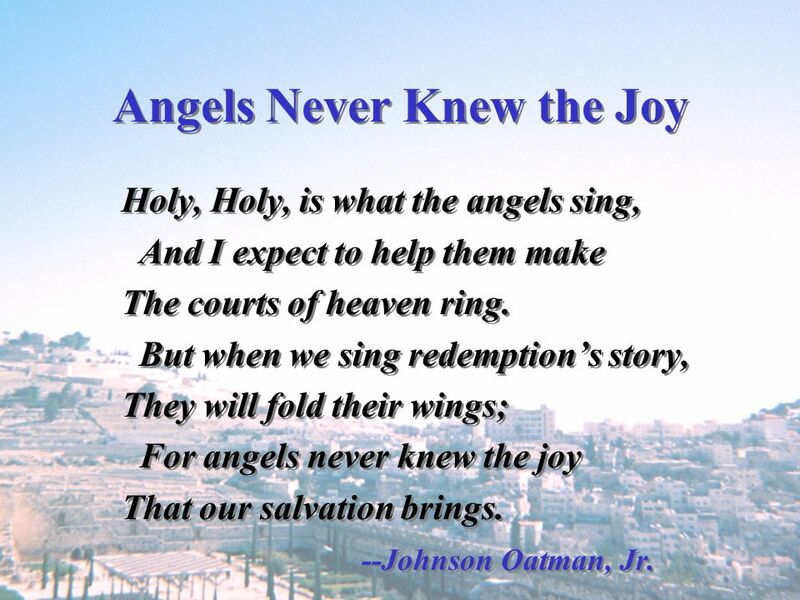 But when we sing redemption’s story, They will fold their wings; For angels never knew the joy That our salvation brings. 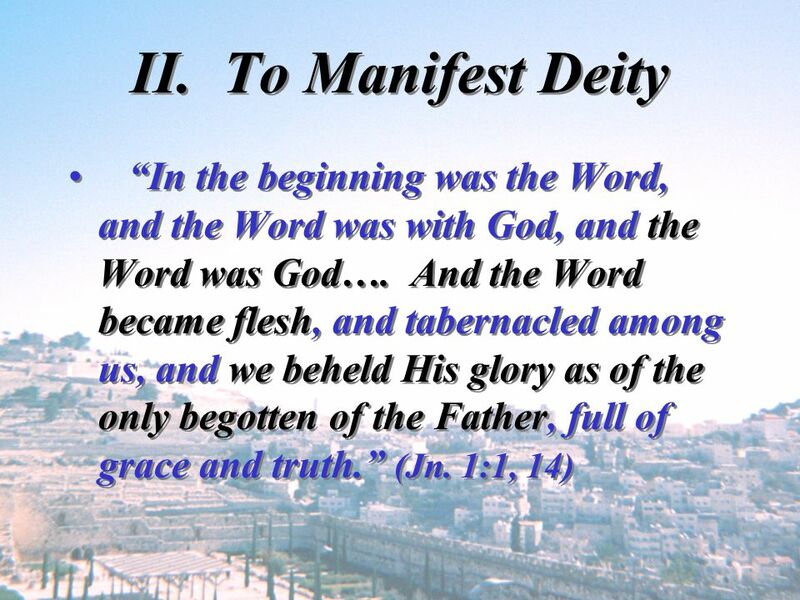 --Johnson Oatman, Jr.
“Behold the Lamb of God who takes way the sin of the world” (Jn. 1:29). “For God so loved the world that He gave is only begotten Son, that whoever believes in Him should not perish but have everlasting life” (Jn. 3:16). 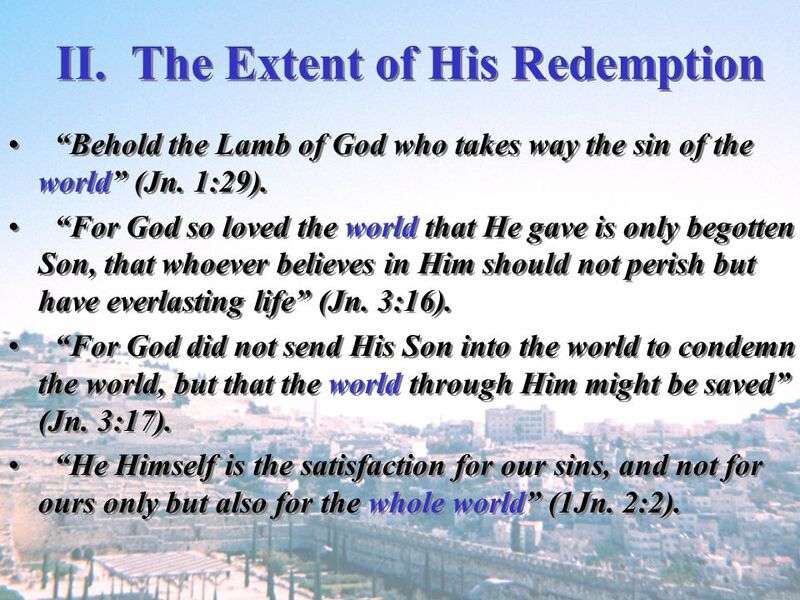 “For God did not send His Son into the world to condemn the world, but that the world through Him might be saved” (Jn. 3:17). 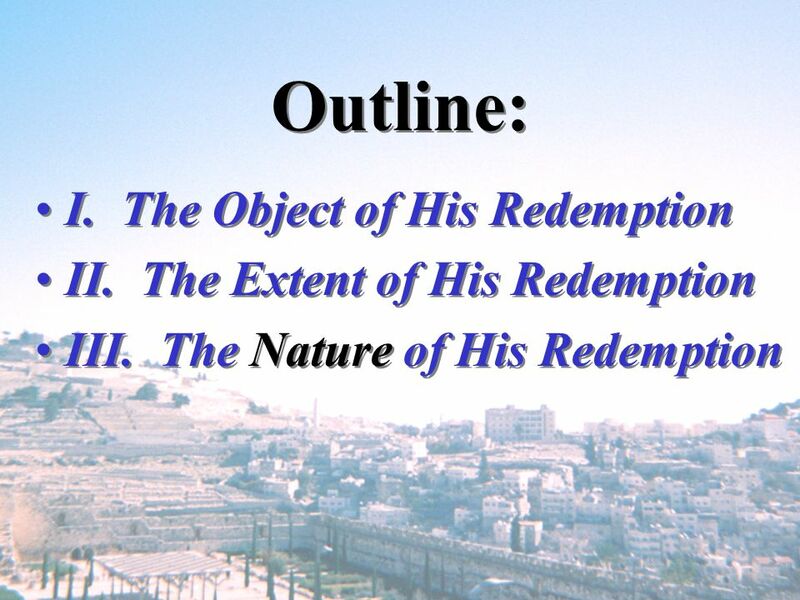 “He Himself is the satisfaction for our sins, and not for ours only but also for the whole world” (1Jn. 2:2). 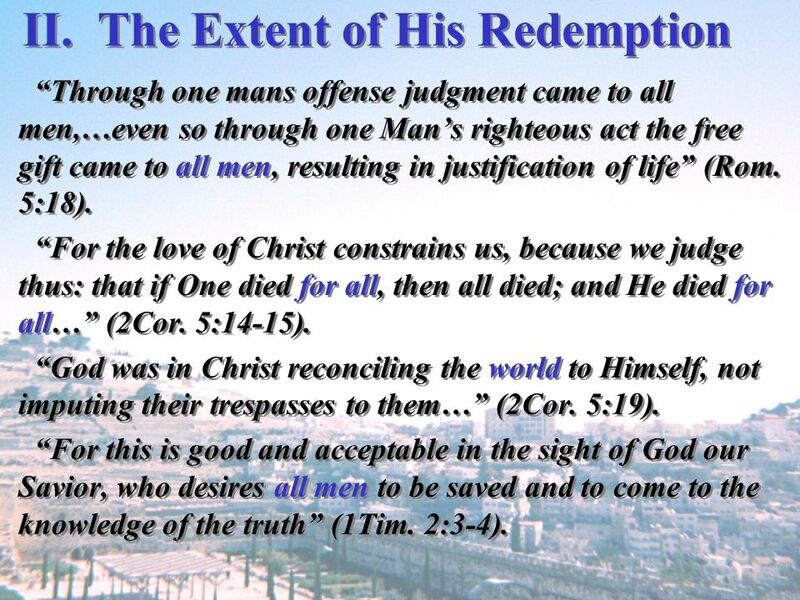 “Through one mans offense judgment came to all men,…even so through one Man’s righteous act the free gift came to all men, resulting in justification of life” (Rom. 5:18). “For the love of Christ constrains us, because we judge thus: that if One died for all, then all died; and He died for all…” (2Cor. 5:14-15). 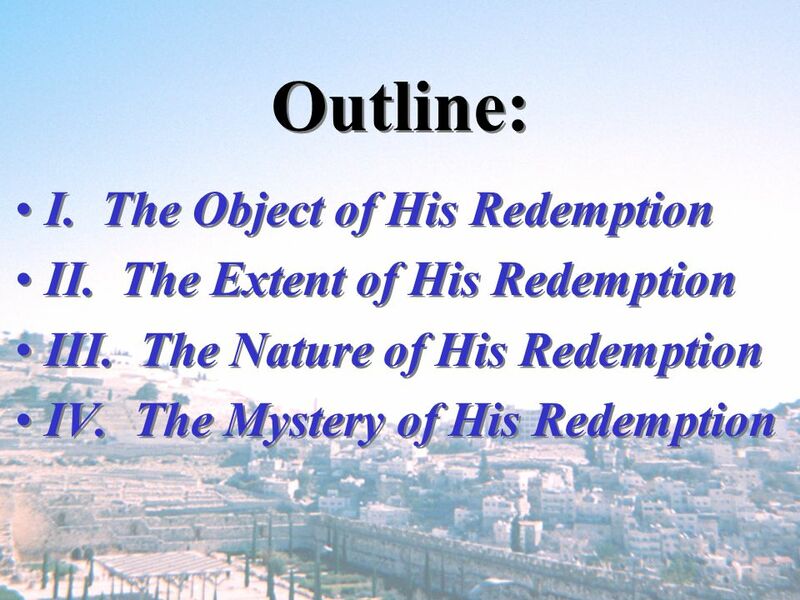 “God was in Christ reconciling the world to Himself, not imputing their trespasses to them…” (2Cor. 5:19). “For this is good and acceptable in the sight of God our Savior, who desires all men to be saved and to come to the knowledge of the truth” (1Tim. 2:3-4). 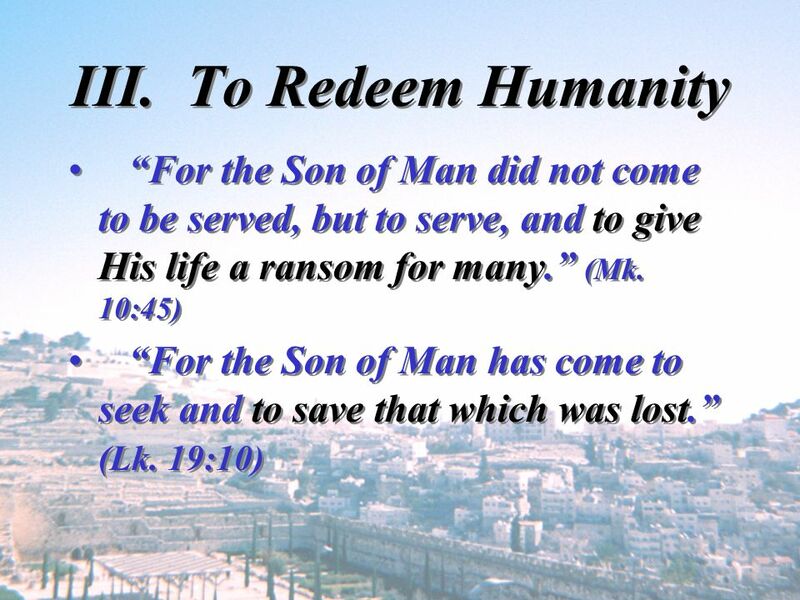 “The Man Christ Jesus who gave Himself a ransom for all…” (1Tim. 2:6). “We see Jesus, who…by the grace of God, might taste death for everyone” (Heb. 2:9). 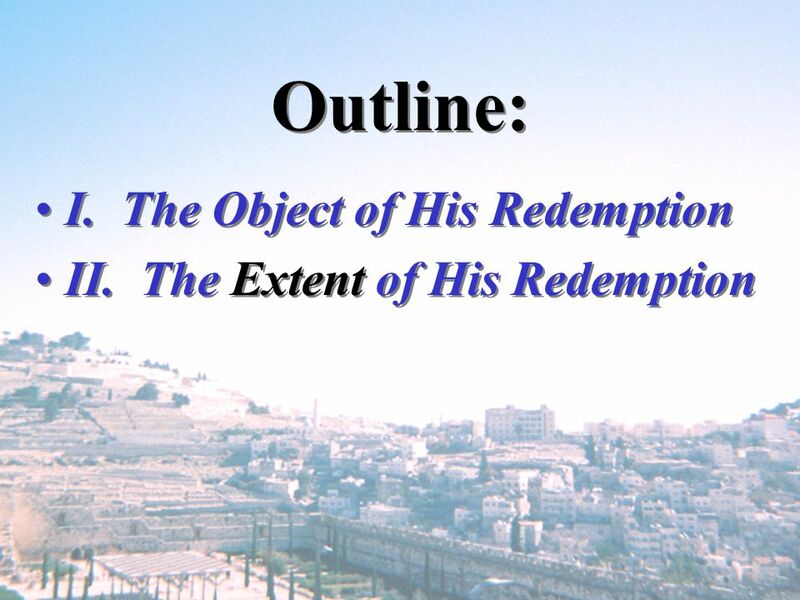 “The Lord…is longsuffering toward us, not willing that any should perish but that all should come to repentance” (2Pet. 3:9). 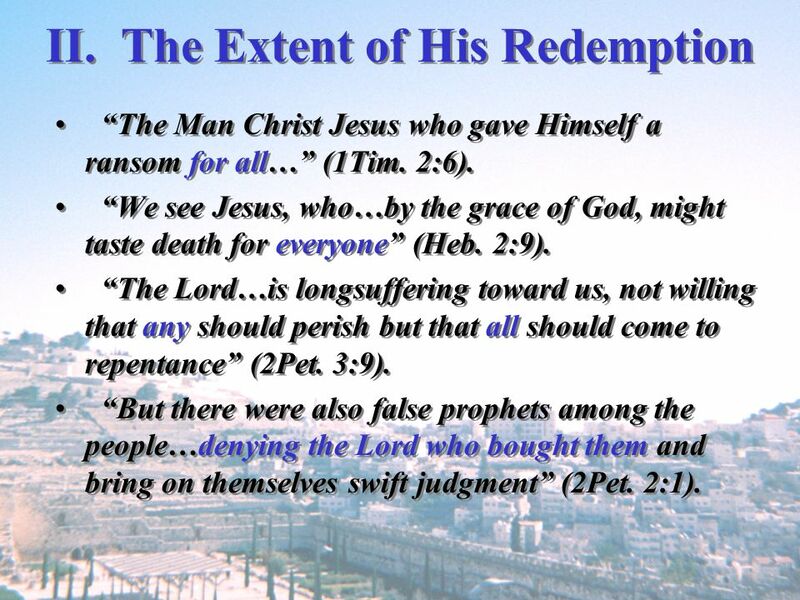 “But there were also false prophets among the people…denying the Lord who bought them and bring on themselves swift judgment” (2Pet. 2:1). 26 What About Other Verses? 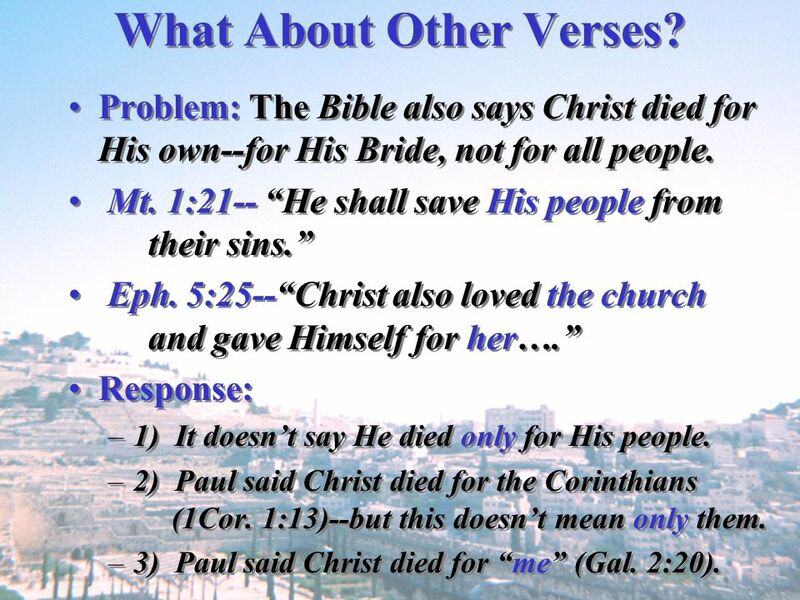 Problem: The Bible also says Christ died for His own--for His Bride, not for all people. Mt. 1:21-- “He shall save His people from their sins.” Eph. 5:25--“Christ also loved the church and gave Himself for her….” Response: 1) It doesn’t say He died only for His people. 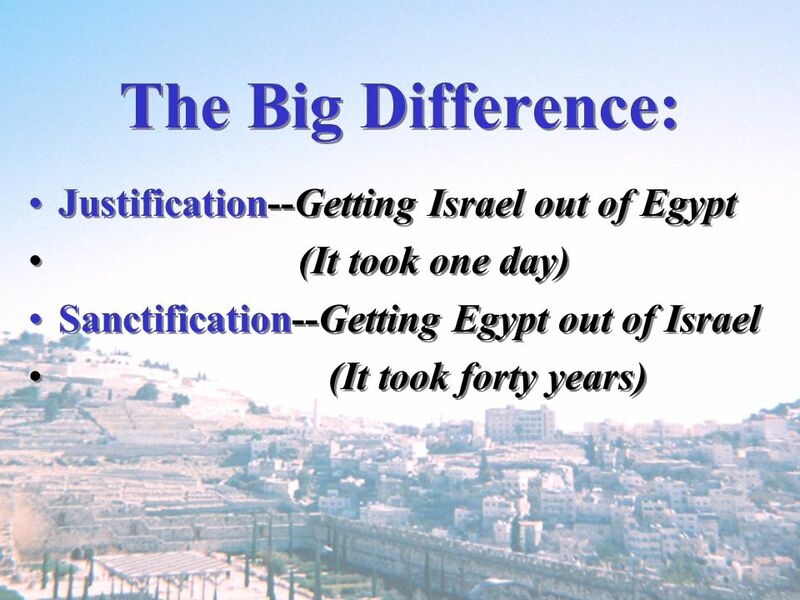 2) Paul said Christ died for the Corinthians (1Cor. 1:13)--but this doesn’t mean only them. 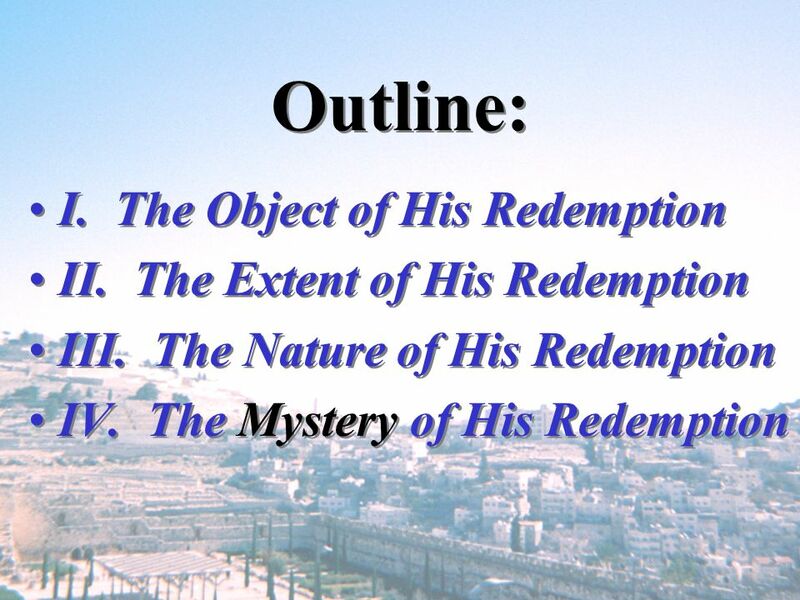 3) Paul said Christ died for “me” (Gal. 2:20). 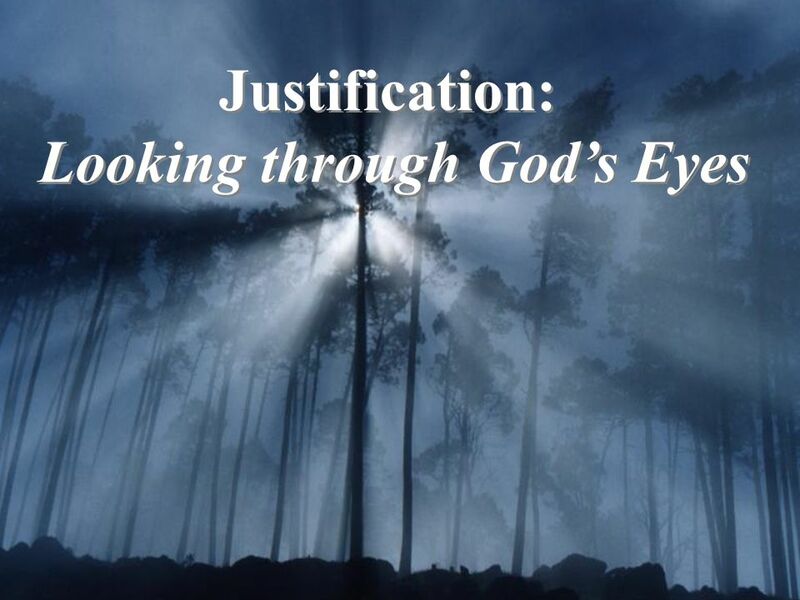 “Therefore we conclude that a man is justified by faith apart from the deeds of the law” (Rom. 3:38). “But to him who does not work but believes on Him who justifies the ungodly, his faith is accounted for righteousness” (Rom. 4:5). “Therefore, having been justified by faith, we have peace with God through our Lord Jesus Christ” (Rom. 5:1). 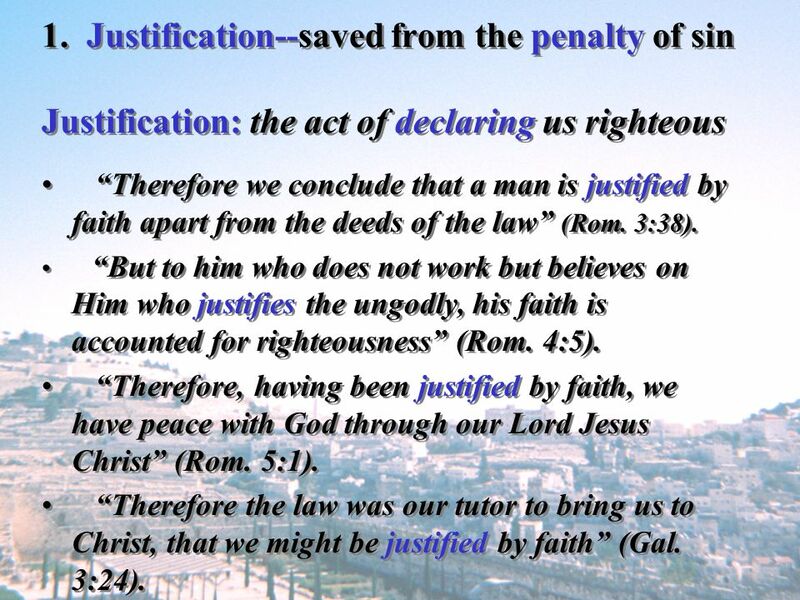 “Therefore the law was our tutor to bring us to Christ, that we might be justified by faith” (Gal. 3:24). 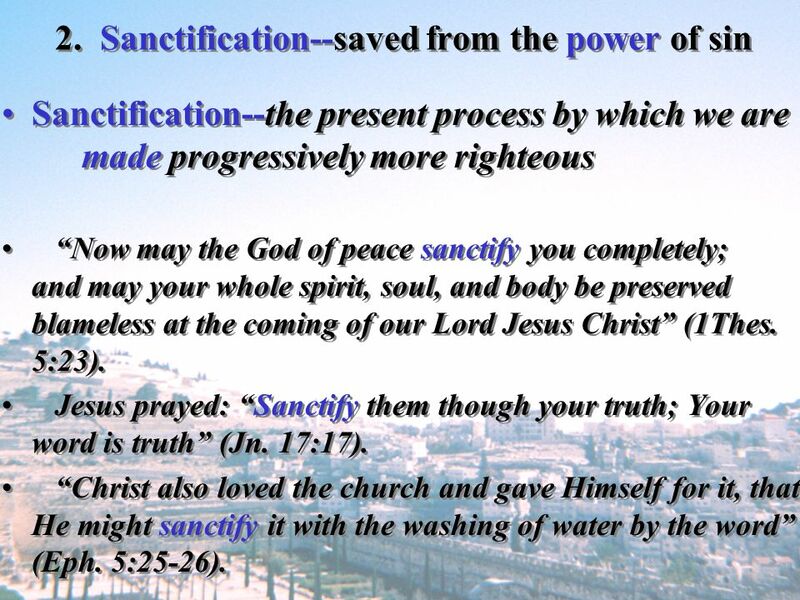 Sanctification--the present process by which we are made progressively more righteous “Now may the God of peace sanctify you completely; and may your whole spirit, soul, and body be preserved blameless at the coming of our Lord Jesus Christ” (1Thes. 5:23). 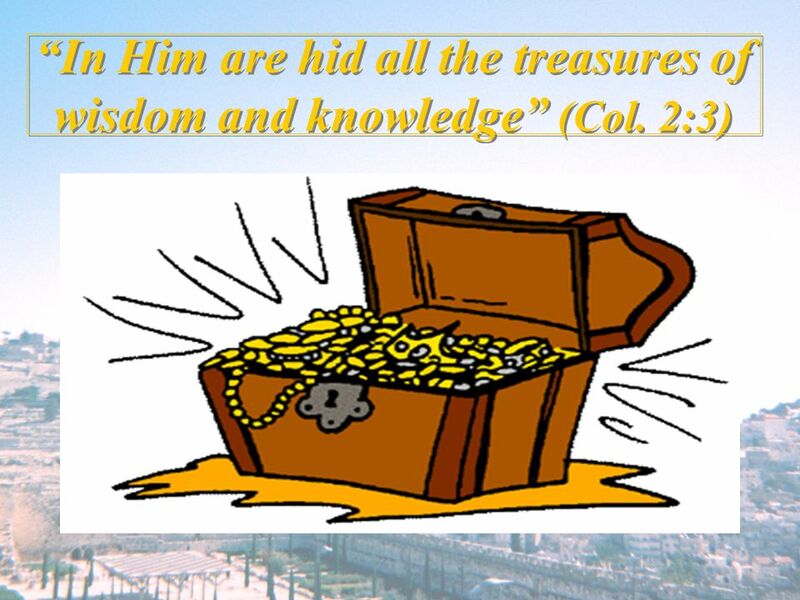 Jesus prayed: “Sanctify them though your truth; Your word is truth” (Jn. 17:17). “Christ also loved the church and gave Himself for it, that He might sanctify it with the washing of water by the word” (Eph. 5:25-26). 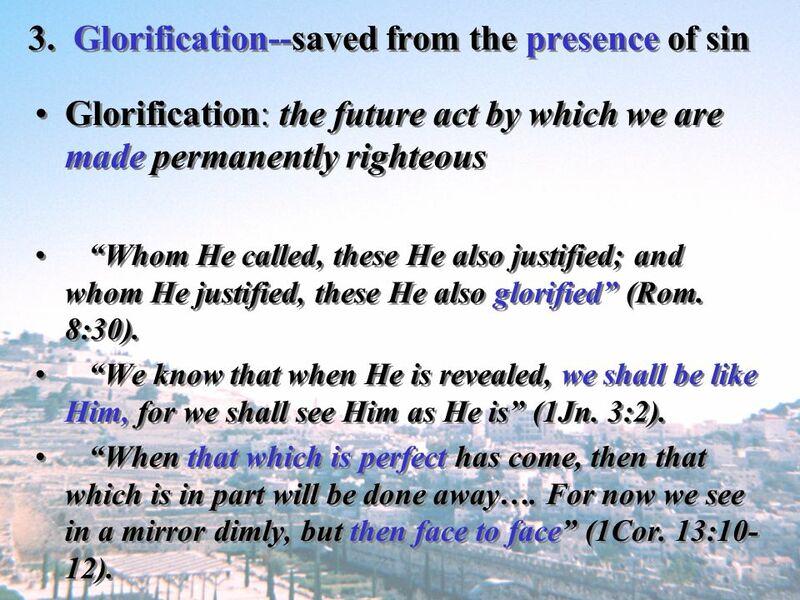 Glorification: the future act by which we are made permanently righteous “Whom He called, these He also justified; and whom He justified, these He also glorified” (Rom. 8:30). “We know that when He is revealed, we shall be like Him, for we shall see Him as He is” (1Jn. 3:2). “When that which is perfect has come, then that which is in part will be done away…. For now we see in a mirror dimly, but then face to face” (1Cor. 13:10-12). 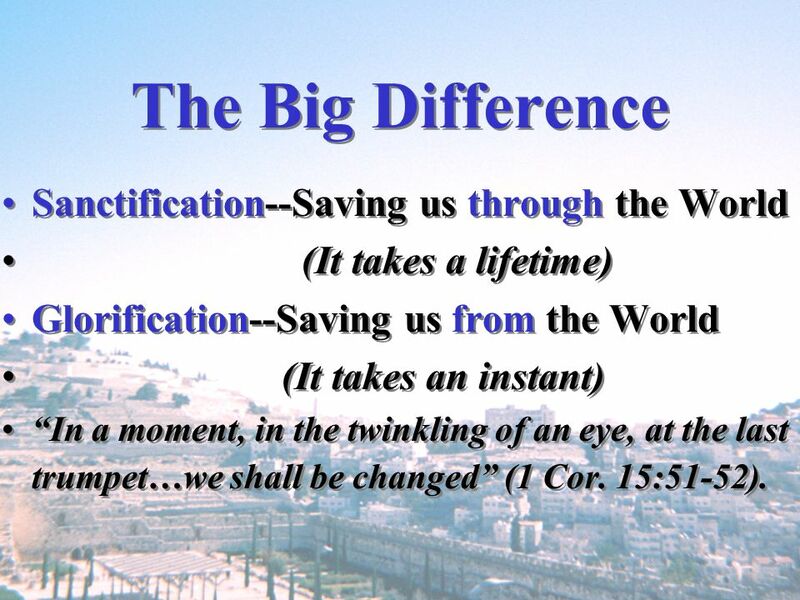 (It takes a lifetime) Glorification--Saving us from the World (It takes an instant) “In a moment, in the twinkling of an eye, at the last trumpet…we shall be changed” (1 Cor. 15:51-52). 1. 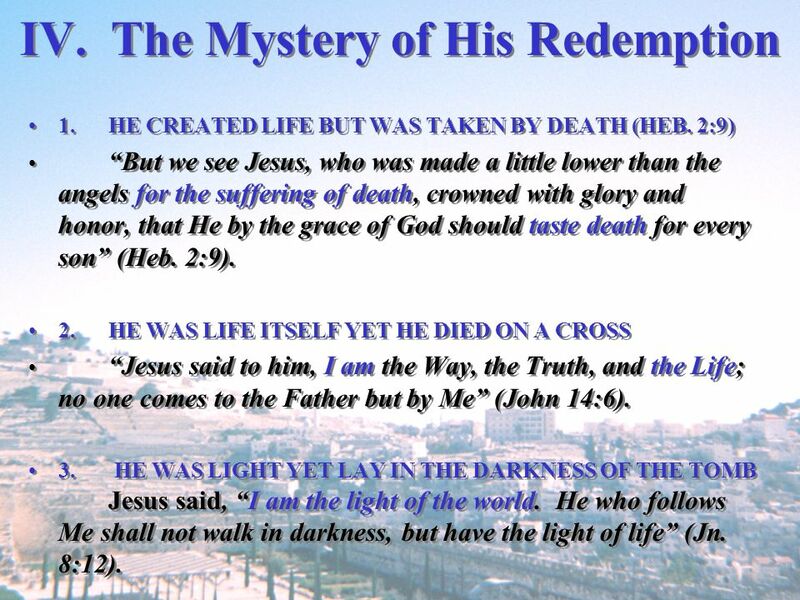 HE CREATED LIFE BUT WAS TAKEN BY DEATH (HEB. 2:9) “But we see Jesus, who was made a little lower than the angels for the suffering of death, crowned with glory and honor, that He by the grace of God should taste death for every son” (Heb. 2:9). 2. HE WAS LIFE ITSELF YET HE DIED ON A CROSS “Jesus said to him, I am the Way, the Truth, and the Life; no one comes to the Father but by Me” (John 14:6). HE WAS LIGHT YET LAY IN THE DARKNESS OF THE TOMB Jesus said, “I am the light of the world. He who follows Me shall not walk in darkness, but have the light of life” (Jn. 8:12). 4. 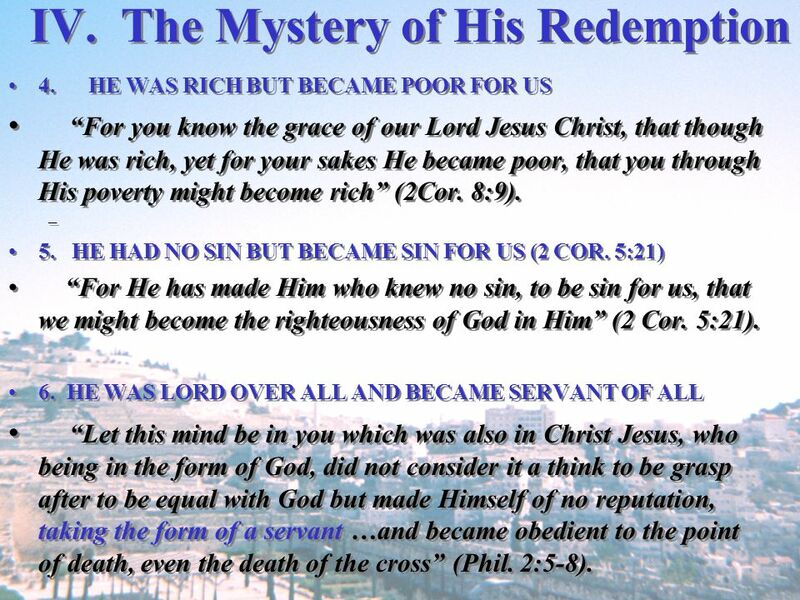 HE WAS RICH BUT BECAME POOR FOR US “For you know the grace of our Lord Jesus Christ, that though He was rich, yet for your sakes He became poor, that you through His poverty might become rich” (2Cor. 8:9). 5. 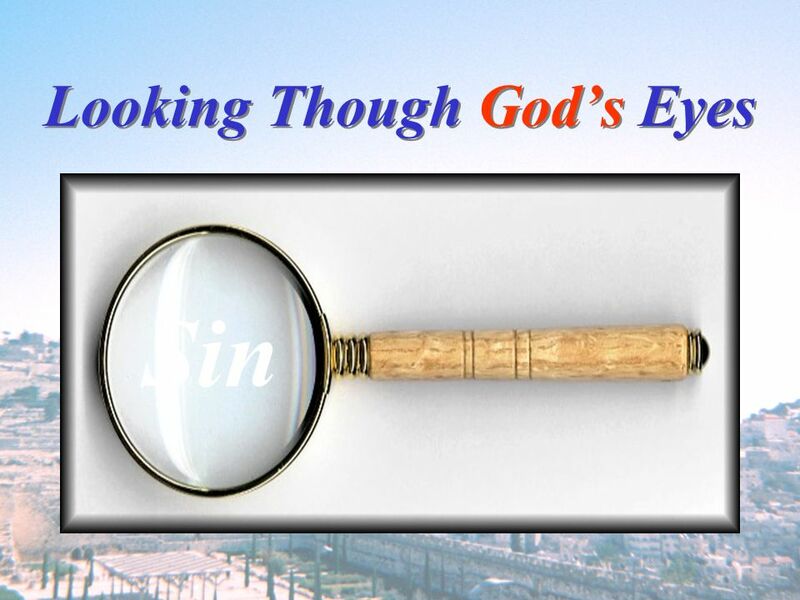 HE HAD NO SIN BUT BECAME SIN FOR US (2 COR. 5:21) “For He has made Him who knew no sin, to be sin for us, that we might become the righteousness of God in Him” (2 Cor. 5:21). 6. HE WAS LORD OVER ALL AND BECAME SERVANT OF ALL “Let this mind be in you which was also in Christ Jesus, who being in the form of God, did not consider it a think to be grasp after to be equal with God but made Himself of no reputation, taking the form of a servant …and became obedient to the point of death, even the death of the cross” (Phil. 2:5-8). 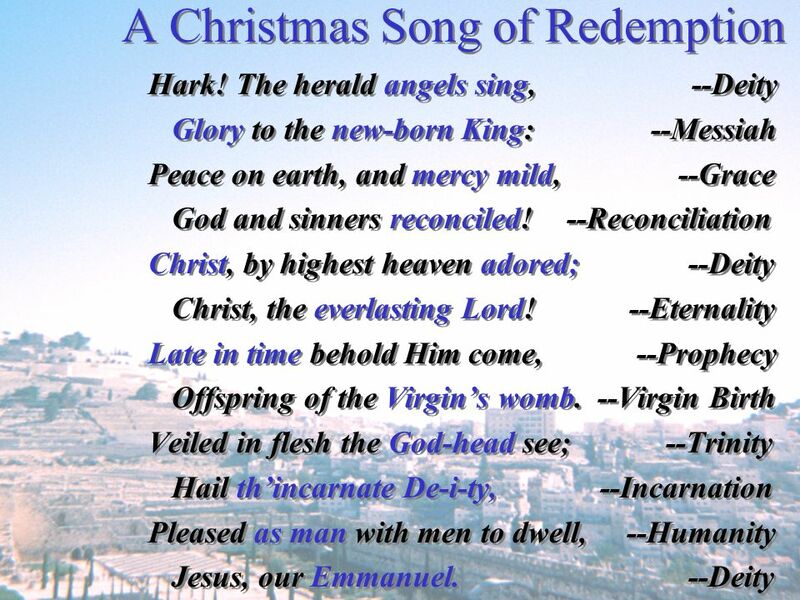 Glory to the new-born King: Peace on earth, and mercy mild, God and sinners reconciled! Christ, by highest heaven adored; Christ, the everlasting Lord! 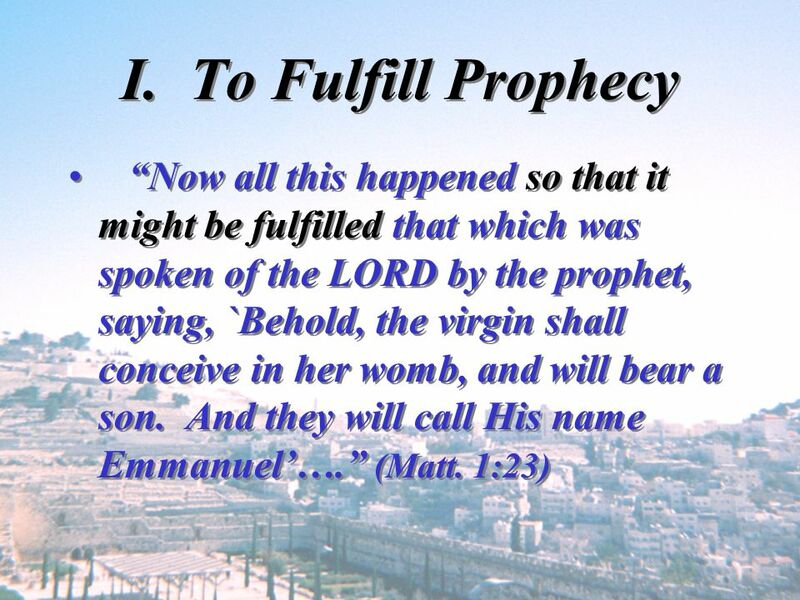 Late in time behold Him come, Offspring of the Virgin’s womb. 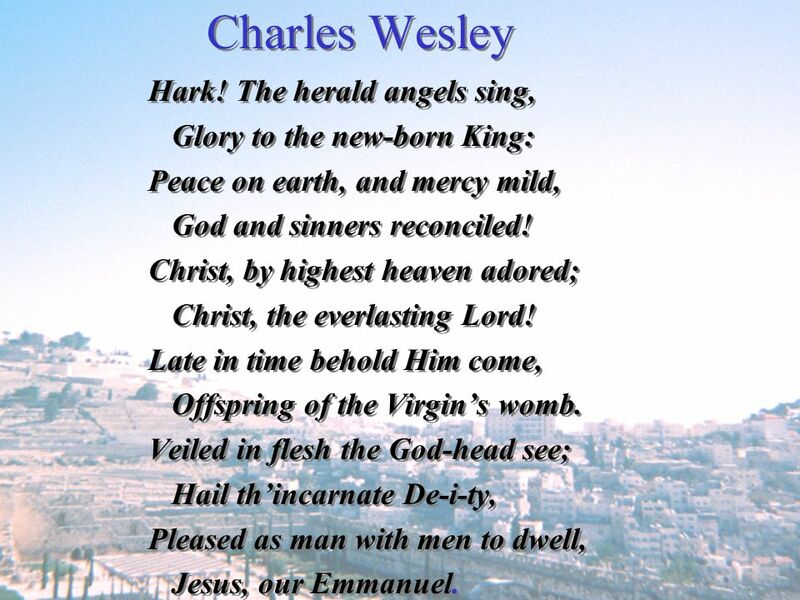 Veiled in flesh the God-head see; Hail th’incarnate De-i-ty, Pleased as man with men to dwell, Jesus, our Emmanuel. 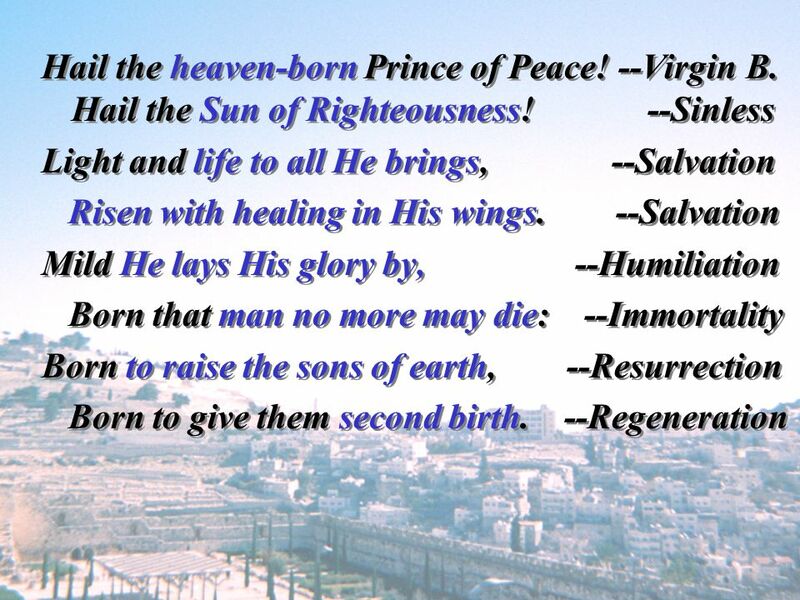 41 Hail the heaven-born Prince of Peace! Hail the Sun of Righteousness! Light and life to all He brings, Risen with healing in His wings. 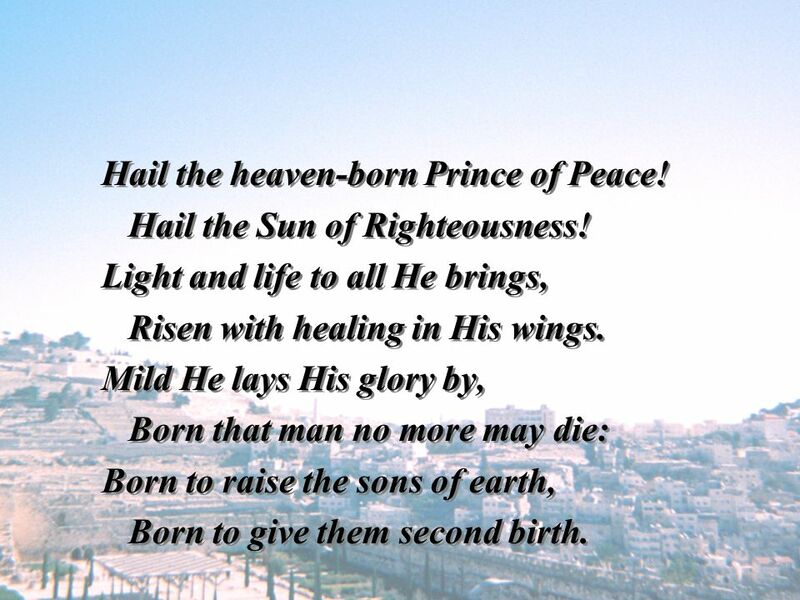 Mild He lays His glory by, Born that man no more may die: Born to raise the sons of earth, Born to give them second birth. 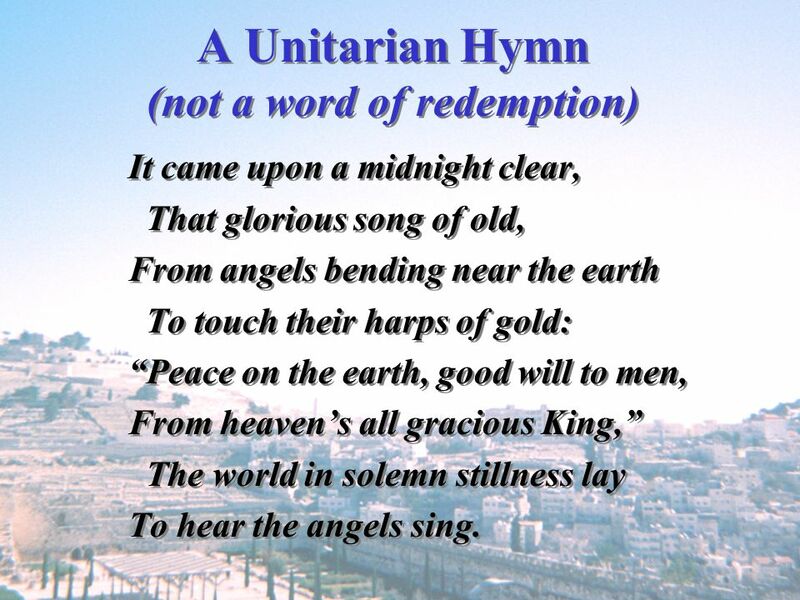 It came upon a midnight clear, That glorious song of old, From angels bending near the earth To touch their harps of gold: “Peace on the earth, good will to men, From heaven’s all gracious King,” The world in solemn stillness lay To hear the angels sing. 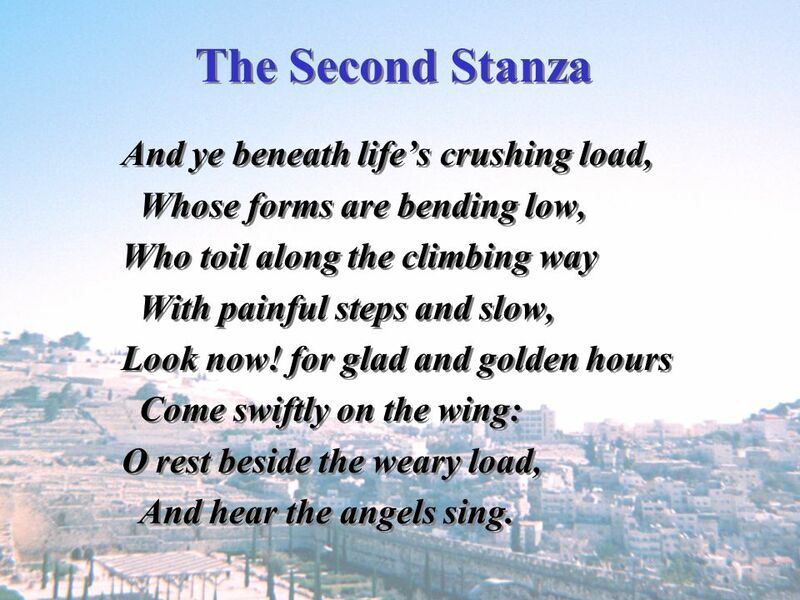 Whose forms are bending low, Who toil along the climbing way With painful steps and slow, Look now! for glad and golden hours Come swiftly on the wing: O rest beside the weary load, And hear the angels sing. 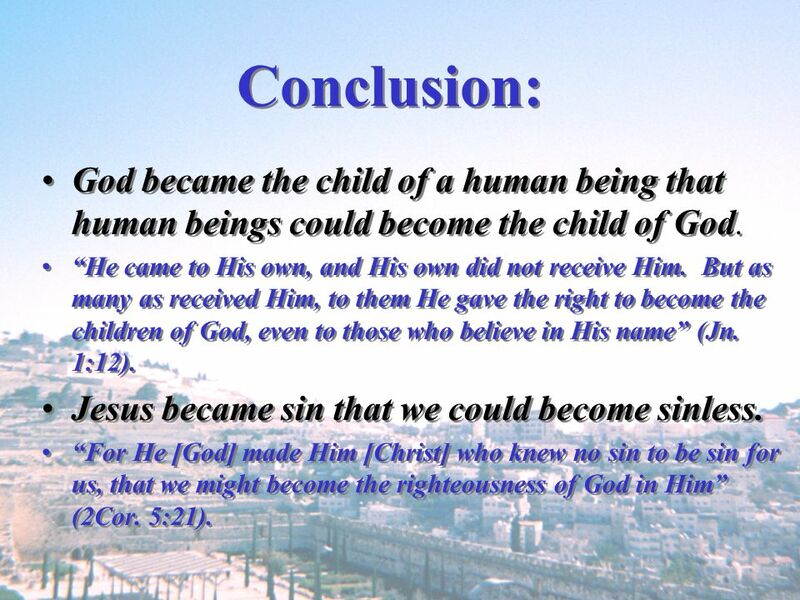 46 Conclusion: God became the child of a human being that human beings could become the child of God. “He came to His own, and His own did not receive Him. But as many as received Him, to them He gave the right to become the children of God, even to those who believe in His name” (Jn. 1:12). 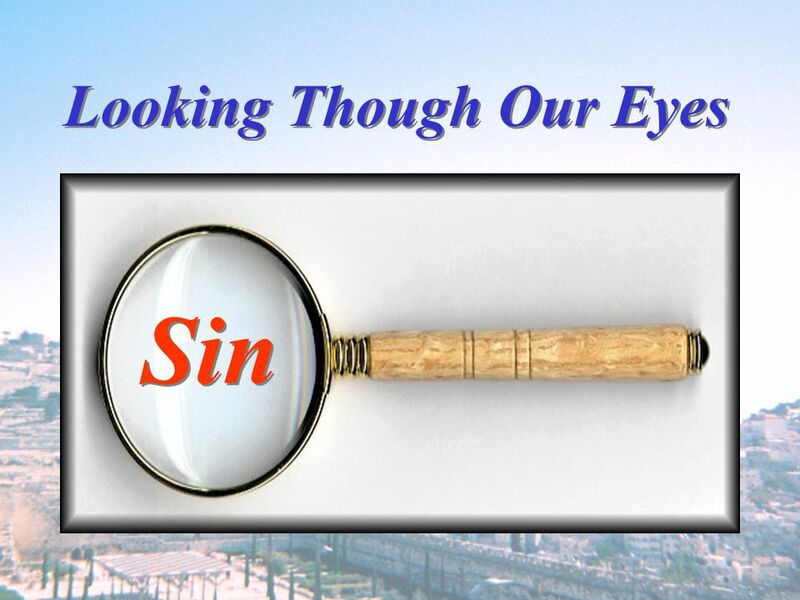 Jesus became sin that we could become sinless. “For He [God] made Him [Christ] who knew no sin to be sin for us, that we might become the righteousness of God in Him” (2Cor. 5:21). 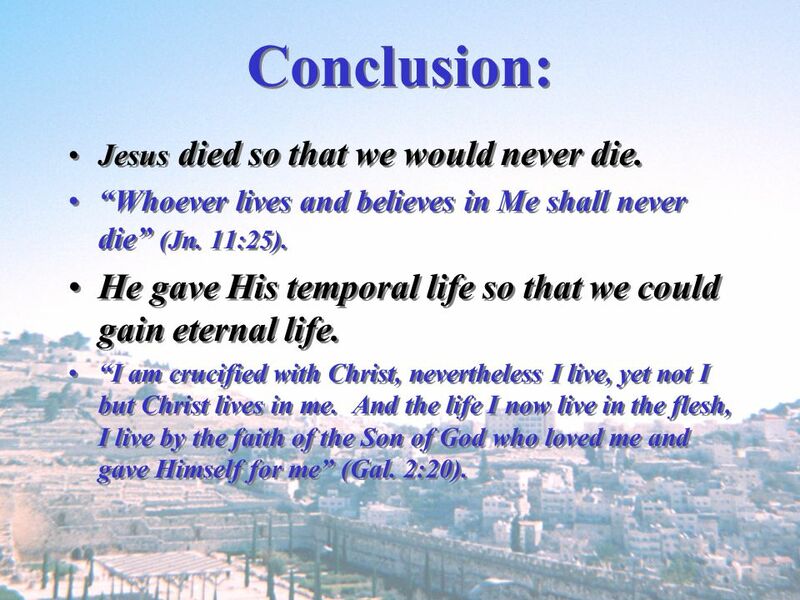 47 Conclusion: Jesus died so that we would never die. “Whoever lives and believes in Me shall never die” (Jn. 11:25). 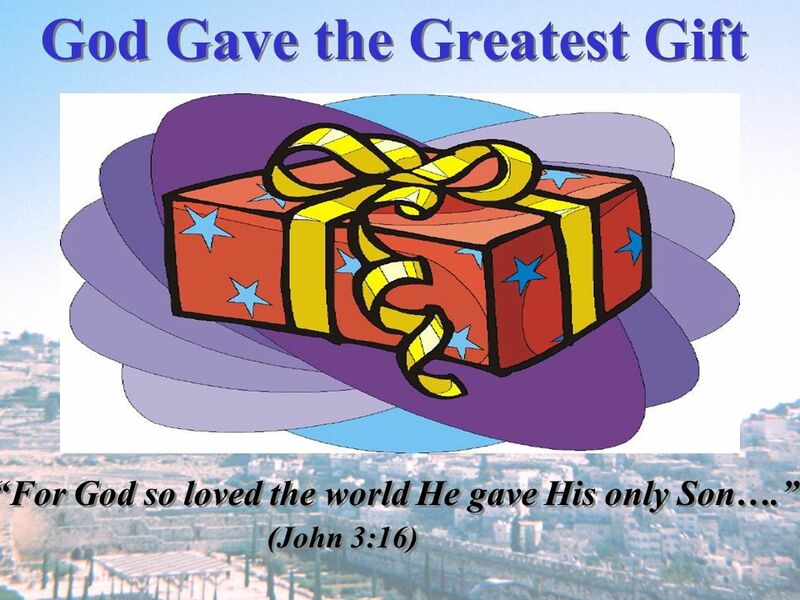 He gave His temporal life so that we could gain eternal life. “I am crucified with Christ, nevertheless I live, yet not I but Christ lives in me. 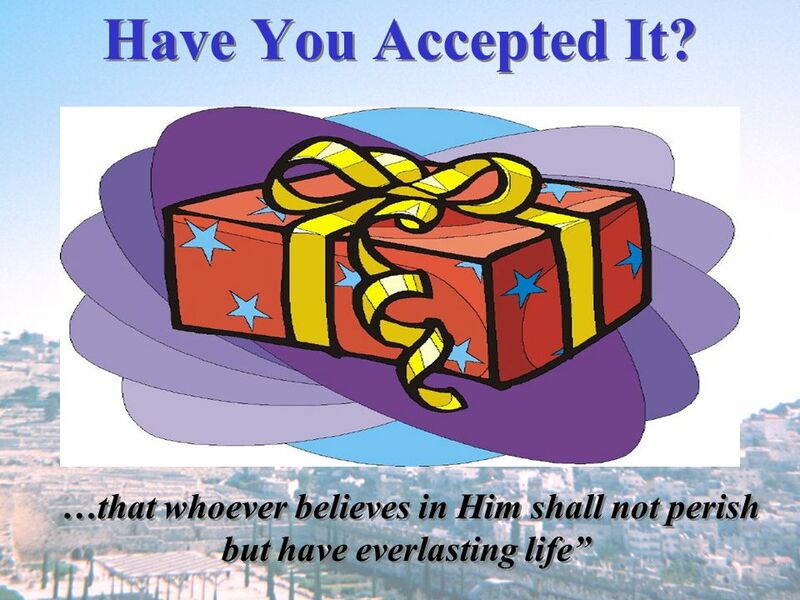 And the life I now live in the flesh, I live by the faith of the Son of God who loved me and gave Himself for me” (Gal. 2:20). 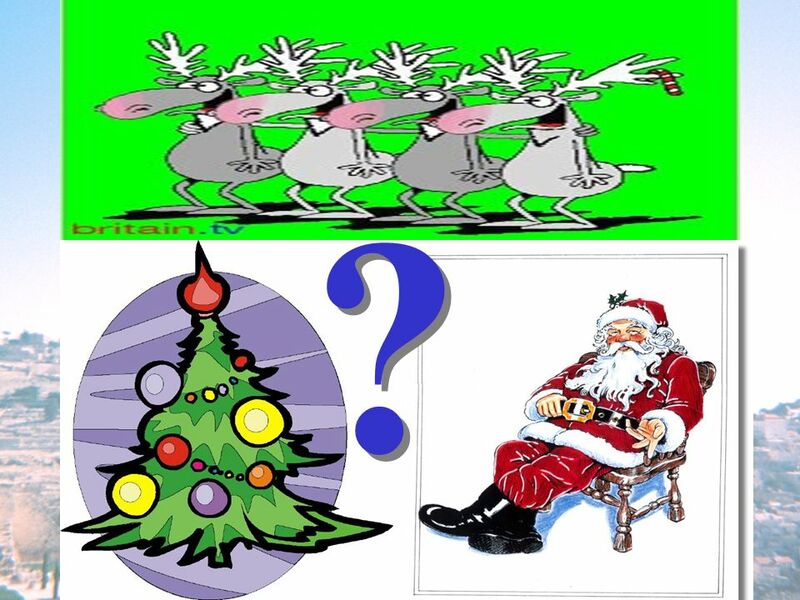 48 What is the Reason for the Season? He came to suffer so we could be happy. He became poor that we could become rich. He came to die so we could live. He became sin that we could become sinless. He was born once so we could be born twice. 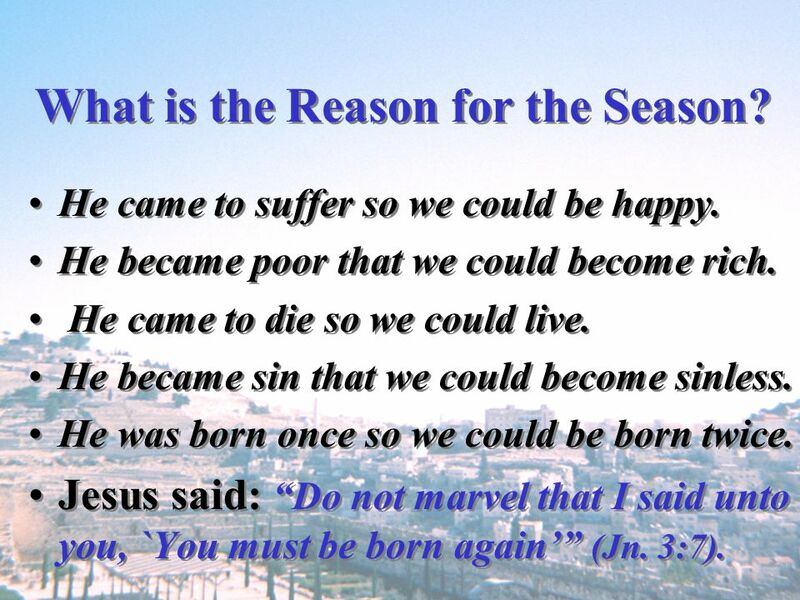 Jesus said: “Do not marvel that I said unto you, `You must be born again’” (Jn. 3:7). 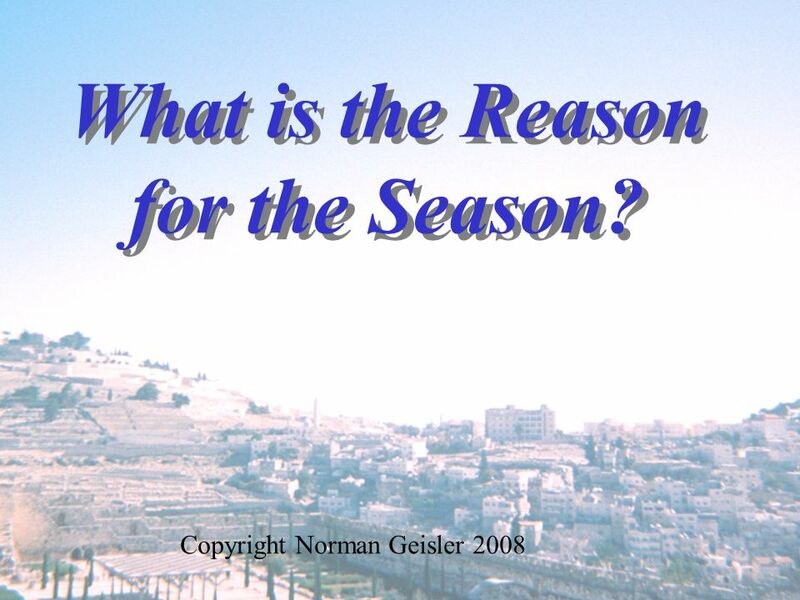 Download ppt "What is the Reason for the Season?" Cross Christ Centrism. For Christ did not send me to baptize, but to preach the gospel, not with wisdom of words, lest the cross of Christ should be made. THEY TOOK HIM AS HE WAS Mark 4: Introduction Mark 4:35-41 records the event of Jesus calming a violent storm on Galilee Jesus was ready to cross. 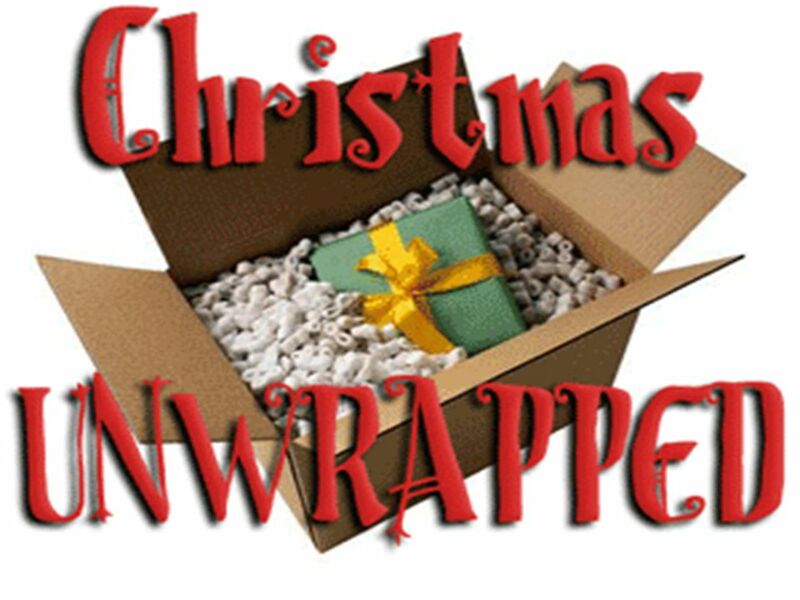 May He Complete... Philippians 1:3-11.